Howard Hall, of Pinnacle Agribusiness, has published his final report on the banana benchmarking program. This project (BA16009) involved data collection throughout 2015/16 and 2016/17 and includes, for the first time, sections on environmental management and farm biosecurity. The report – ‘Banana Enterprise Comparison 2016/17’ – provides insight from more than 300 participants across Australia’s growing regions. The report is available through Hort Innovation’s portal here. Congratulations to the Cassowary Coast Banana Growers Association executive who have all been re-elected for another year. Dean Sinton will continue as President, Naomi Brownrigg as Secretary and Luke Gibert as Treasurer. The BGA’s Annual General Meeting was held at the Silkwood Hotel last night. If you’re interested in bioreactors (think nitrogen traps), there’s a field day and forum happening on the Cassowary Coast next week. You’ll get a chance to visit sites, question experts and hear about different methods and approaches. Contact: Get in touch with Rhianna Robinson for details of where to meet for the site visit – rhianna.robinson@daf.qld.gov.au or 0431 088 918. The field day and forum is an initiative of the Department of Agriculture and Fisheries’ Bioreactor Project, funded by the Queensland Government. High Efficiency Sediment Basin being retrofitted on an Innisfail banana farm. Farmers continue to lead the way in trialing new initiatives to reduce nutrient, sediment and pesticide loads flowing to the Reef. 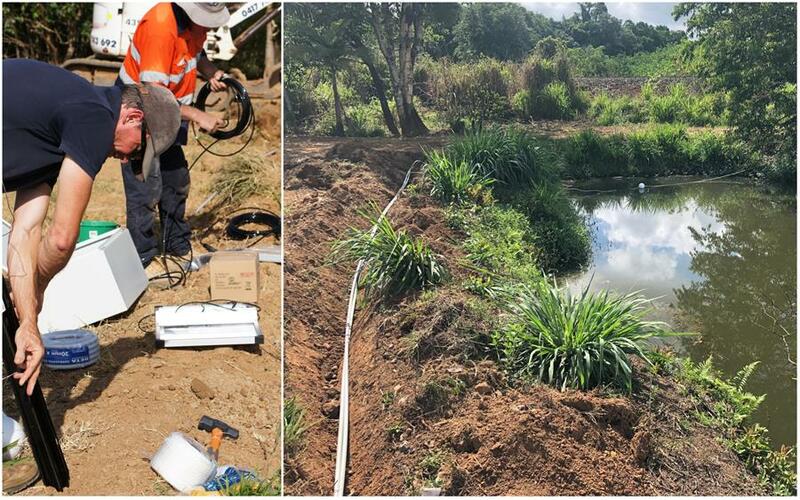 A High Efficiency Sediment (HES) Basin was recently installed on an Innisfail banana farm, as part of the Wet Tropics Major Integrated Project (MIP). The MIP team and Australian Banana Growers Council have completed training in operation and maintenance of the HES basin, and water quality sampling is scheduled to start in December, weather permitting. Voice of Horticulture has welcomed the Federal Government’s changes to the rules around backpacker and working holiday visas. In a statement, the peak industry body said that Australia’s horticulture sector, in particular growers, now have greater access to a skilled labour community following changes to the Working Holiday Maker and Seasonal Worker programs. · Backpackers will no longer need to leave their jobs every six months and will be able to triple the length of their stay in Australia if they do extra agricultural work. · The number of Seasonal Worker Visas granted to Pacific Island workers increases from nearly 8500 (2017-18) to 14,000, with an extended timeframe for labour market testing validity from three to six months. And, reduced out-of-pocket costs for employers, who will be responsible for $300 rather than $500 of travel costs for workers. Read VoH’s full statement here. The results for the first half of Australian Bananas’ Peel Good, Feel Good campaign are in – and they’re looking good! Data shows the campaign excelled in all benchmarks. Among the highlights were metro and regional television advertising, which included time slots to fit in with high profile shows including The Block, The Project, The Bachelor and Hamish and Andy’s True Story. Australian Bananas appeared in 10 out of the top 10 metro TV programs from August to September. Social media also continued to hit the mark, with a large increase to 1.56 million users reached. In fact, this October result was the best this year so far. Over coming months, keep an eye out for targeted summer and Christmas marketing, with a focus on sharing delicious recipes like Bananamisu and Banana Pavlova Trifle. Members of the Australian Banana Growers’ Council are invited to attend the 2019 Annual General Meeting in Tully on Wednesday, November 21. The AGM will be held from 5.30pm at the Tully and District Senior Citizens Club (19 Blackman Street). Director nominations have been received from Ms Jade Buchanan (QLD) and Mr Tom Day (WA), with no election required for these positions as there were no other nominations. The meeting will be followed by a barbeque, for attendees and their families. The ABGC looks forward to seeing members there. Contact Head Office for any further information on 07 3278 4786.